On their way home - Food, Drink, Photography, and other things. I was on the platform at New Street station, standing next to my train waiting for the doors to open. Some people walked past with bin bags tied around their legs as makeshift waterproof leggings. All I can assume is that they were on their way home from the mudbath which was this years Glastonbury Festival. I was still feeling a bit full after last nights visit to the Oriental Palace so I don't think I managed to eat as much as I might otherwise have done. This was an office trip which also included the Senior Manager and Secretary/PA so I thought it wise to show a little restraint and not over-fill my plate. This plan may have back-fired because I needed more visits to the serving area, so it may have looked like I was eating more than I was. Jimmy Spices is yet another of the Asian/Italian buffet places which seem to be quite popular these days. The starters included spring rolls, pizza slices, assorted types of salad and pasta. Main courses were the usual selection of curries but also a 'Live Stir Fry' where you select the raw ingredients and have them cooked for you. There was no sign of the Thai food which is advertised but there were a lot of empty spaces where the serving bowls were so I imagine a fuller selection is offered in the evenings. Puddings were more limited than at other buffet places. There was Fruit, Strawberry mousse, ice cream and something resembling a stodgy cheesecake but on a thin sponge base. The one novel feature was the provision of ice cream cones but sadly no sauces or sprinkles. There must have been one very embarrassed person listening to the Birmingham Philharmonic. During a short silence in the middle of a piece of music (possibly Gershwin's American in Paris) the familiar beeps of the Nokia 'SMS' ringtone could be clearly heard. We decided to use our new National Trust memberships to visit a couple of nearby properties - Packwood House and Baddesley Clinton, both only a few miles from each other. We had a bit of a walk around each of the houses and parts of the grounds but it was a bit too cold to be spending much time outside. Packwood House has interesting grounds, having an over-abundance of sundials and a Yew garden set out like the Sermon on the Mount. Baddesley Clinton House is slightly more unusual, set in a moat where we fed our sandwich crusts to the ducks. I was walking home last night when I saw a poster advertising the NatWest bank. What struck me as odd was that it was in Polish. Unfortunately it was one of those 'rolling poster' types and it changed while I was walking past and I've not seen it since. Our local Tesco also seems to be getting taken over by the Polish. They've got a shelf full of polish food and we had a leaflet pushed through the door advertising this (written in polish of course). We've tried some of their pomegranate drink and it was ok but didn't actually contain much pomegranate juice. I was tempted to try some of the chicken pate but it was a bit fatty. Ah well, back to the M&S Potted Chicken then. It has been very windy today. Whenever it's windy, a strange sound can be heard from the back of our house. It's a low moaning note, sounding like a lower version of when you blow over a bottle top. We hope it is just air blowing past a pipe and not some sort of wind monster outside. On my way to work this morning, the pavements were blocked by wheelie bins lying on their sides, victims of the wind overnight. The trains were running but were reduced to 50mph for safety. At least they were running. Things weren't so good tonight. I had heard that the Virgin Trains to London had been cancelled but I got to New Street at my usual time in the hope that I wouldn't have to wait long for a train. I couldn't check the 'Live Departures' website because it was down. The screens at New Street were all displaying a notice apologising for the disruption caused by the weather. The station was surprisingly quiet. There weren't many trains at the platforms and surprisingly few people standing around. I overheard someone saying that the main entrance to the station had been closed. With no train times being displayed, everyone was milling around on the bridge waiting for an announcement over the tannoy. Thankfully a train to Coventry was announced. I managed to get a seat. The train was surprisingly empty given that it was one of the few actually leaving. The exercise in crowd control at the main entrance seemed to be a bit over zealous meaning a lot of people couldn't get to the platforms. I couldn't find my wallet this morning - I realised I must have left it in my desk in work. I didn't want it there all weekend so I thought it would be best for me to nip back in to retrieve it. It was a 3 hour 'nip'. There were no trains running from Coventry station (thanks to engineering works) so I had to get onto a rail replacement bus. 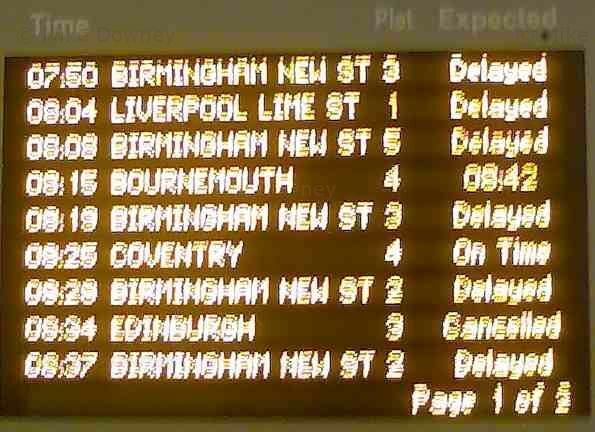 This decided to stop at every station between Coventry and Birmingham International and took ages. The only consolation was seeing a goat standing on a picnic table, somewhere halfway between Canley and Tile Hill. It was our work's Christmas Do today. I bumped into one of my office colleagues while I was en-route to the station to meet Emma. We went for a pint at the German Market before meeting everyone else at the restaurant. The restaurant seemed to struggle with this many people. They had difficulty finding enough seats. Service was a little slow and irregular, it took a while to get served and we ended up with several spare starters and desserts. I think that's why they encouraged all the dancing, to distract people from the quality of the service. The food was good though. We only bought our tickets a week ago - we decided to go because we found out that some of Emma's friends from home (Judy and Helen) were going, and we were going to meet them there. We had tickets for the 10:30 Anthony Worral Thompson theatre show so we turned up in plenty of time to wander through the hall and start sampling the food and drink on offer. We took our seats in the theatre, only to find Helen and Judy sitting behind us, just a few seats away. 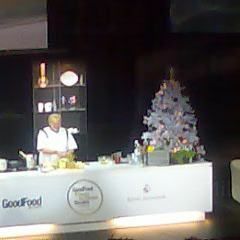 The cookery demonstration wasn't as destructive as last year, with no kitchen equipment falling apart. Gordon Ramsay did get mentioned a few times. AWT referred to how he doesn't dislike Ramsay and considers him a good chef, but since it isn't reciprocated he referred to him as a bit of a prat. There were other celebrity chefs doing public demonstrations in the halls. We saw Paul Rankin and James Martin at various times but didn't hang around to watch. There were too many free samples to go after. It wasn't all free food though. We did buy some things - a few bottles of cider, some 'nairns' oat cakes, some 'seabrooks' crisps, an assortment of Hersheys chocolate/Reeses peanut butter sweets, and some cooking oil. It was a lot to carry around with us by the time we were ready to leave. This morning's journey to work took about three times as long as it normally does. The journey was ok until the approach to Birmingham International where the train sat motionless for a few minutes before pulling into the station. After a short wait an announcement was made telling us we had to leave the train and board a different one on another platform. Everyone dutifully trudged over to that platform and started to cram themselves onto the train but it soon filled up and left, with half the people still on the platform. The 'paddle waver' (who seems to be there to indicate to the driver whether anything's trapped in the door) had made a swift departure and had gone into hiding so there was no-one to ask what was happening. I went up to the concourse to wait, but that proved to be almost as cold and draughty as the platform. There was an announcement that all trains to New Street had been cancelled. A few minutes later we were told to go to another platform and board the train there. We were warned that due to a trackside failure the train would proceed slowly to New Street. Then about a minute later we were told that the train was out of service and to return to the concourse for further news. The train driver did admit that the delays were caused by an overhead power line failure though. Eventually we managed to get onto a train which was bound for Liverpool. This stopped at most of the local stations on the way to New Street but at least it was moving. The whole sorry comedy of errors meant that I got to work about an hour late. The German Market is back in Birmingham for the run-up to Christmas, in it's usual place at the Victoria Square/New Street area. Last year I bought some really tasty candied macadamia nuts from one of the stalls so I decided to get some more. I popped down during my lunch break. The first 'nut stall' I got to, there was nobody manning it but there was a 'Help Wanted' sign. They must have gone to lunch. The second stall was up and running. The bags of macadamias were 50p cheaper at this one but I decided to get the larger bag of assorted nuts instead. The bear of very little brain seems to have gained an intellect in China, although he does seem to need biscuits in order to achieve it. I found these in one of the Chinese supermarkets in Birmingham. The biscuits are number shaped and taste quite sweet, only marred by the bitter taste left by the Disney logo on the front of the pack. Winnie the Pooh 'Intellect Biscuits'. Update (28/10/06): We have eaten most of the pack and although the numbers go from 0 to 9, there don't seem to be any 1's. 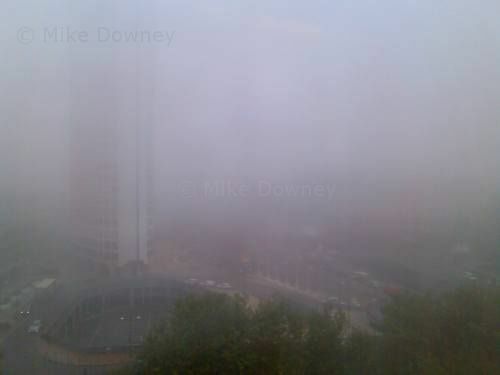 We've had a couple of foggy days this week, with today being the worst. From the top floor in work you couldn't see much of the city. I noticed the Flower Dalek on its side on friday morning but I didn't take a photo at the time. 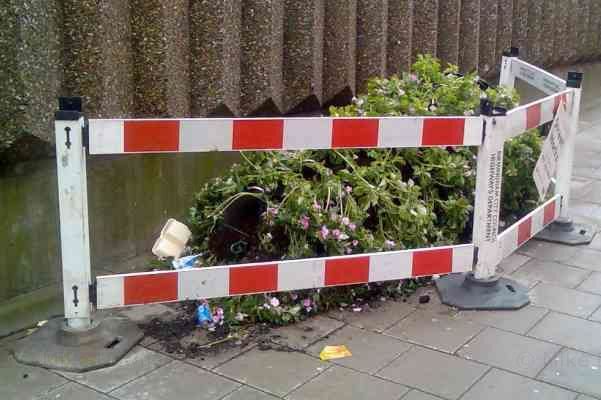 It was still there this morning but the council had put a barrier around it. 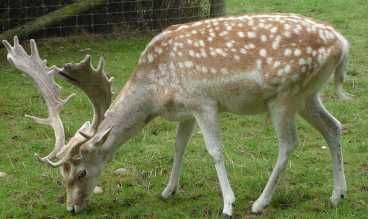 Located a couple of miles from the city centre, this is a small zoo next to Cannon Hill Park. 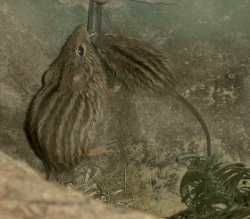 They had a good range of animals, including the obligatory Lemurs, a cute selection of rodents (including the Striped Mice pictured below), and their latest star exhibits - some Red Pandas (which kept themselves hidden while we were there).